Stella: Why is it so important in literature to find characters who are familiar? Why is it important to find characters who are unfamiliar? Nicole: We need stories. We need to know what’s gone before, what is happening now and what is possible in the future. Stories tell us these things and more. If we aren’t given the opportunity to see ourselves reflected in stories that matter to us, it limits our notion of ‘the world’ and all its possibilities. It also robs us of the opportunity to dream. It got me thinking about what I’d read as a child, and whether there were any Australian authors that influenced me. Today we have many established and emerging Aussie authors of picture and chapter books, Middle Grade, Young Adult and New Adult books, who help reflect our society and provide characters and settings that we may both know and not know. Whichever way it falls, as Nicole says above – we need that ‘opportunity to dream’. Back in the 1970s and 80s it was a different matter. We read mostly overseas authors – Judy Blume, Roald Dahl, Enid Blyton. All wonderful and wild authors who set our imaginations on fire and taught us about other cultures, for sure. But where was our own culture? Well, I was perhaps nine or ten when I was lucky enough to discover the Billabong series. The first one, A Little Bush Maid, was written in 1910, so you couldn’t expect it to be politically correct by today’s standards. But as a kid in the outer suburbs of Melbourne in the 70s, it was mind-blowing, or perhaps opening: a young girl growing up on a rural cattle station, in my home state, in the early 20th century. It was a new world, somewhat familiar in its descriptions of the Australian bush, but at the same time exotic – a girl only a few years older than me, mustering cattle on horseback, cracking her whip. Wow! For a young girl from a conservative suburb, this was heaven. Norah Linton ‘spent about two-thirds of her waking time on horseback’. The rest was spent with her dogs, working in the cattleyards, fishing in the lagoon, climbing trees, and tending rescued kangaroos, wallabies, parrots and cockatoos. Sure, she could also cook, sew, knit and play the piano, and was taught school lessons by a visiting tutor, but her heart lay with the natural world. I learnt many lessons in life from these books – the swagmen on the road looking for tucker (food) in exchange for work; the terror of bushfires and drought; the cruelty and ignorance towards animals (not by Norah or her family, of course); and the strange shadow-life of the Aboriginal people who were treated gently enough, but in that awful patronising way of the squatters (white settlers), like they were less than human. At least Norah, especially in one of the later books, recognises their skills and culture, and they were valued members of the fictional ‘Billabong homestead’ staff. Bruce wrote fifteen books in total, following Norah as she grew into a strong, loving, independent, practical woman. She saw her brother and his schoolfriends head off to the Great War, and the dreadful effects of their experiences. She married her older brother’s best mate, her beloved Wally, who had ‘laid his heart at Norah’s feet’ on his first holiday visit to Billabong as a youngster. And she created her own life on a homestead of their own, working in complete partnership with her soul mate, and never worrying what anyone else thought. I wonder now about the influence of Norah on me as a young girl. Of course, if I had been a different girl, less tomboyish, I may not have read these books with so much interest. But I imagine that just being able to read about someone doing those things, in my country, despite being a ‘delicate female’, was enough to make me want this for myself and head in that direction. I spent much time swimming, playing with our dogs, bike-riding, mucking around in our garden plus the local creek and bush sanctuary, just general outdoorsy stuff. I added to that by learning to ride, on borrowed horses at our local pony club, and eventually headed off to agricultural college after finishing secondary school. It was a life-changing experience that led to working on horse properties around Australia (including some cattle & sheep mustering on horseback, minus the big whip!) and in Ireland. It even influenced me to spend three months travelling in South America in 2000, partly to visit the Argentinians I’d been to college with. I may never have been brave enough to go if I hadn’t had friends there! Today it’s wonderful to know that children and teenagers can read about the different people from their own country but from all sorts of backgrounds and experiences. The kids have the opportunity to feel at home while being enriched by learning about various cultures, religions, lifestyles and sexualities, from multiple points of view. Every country needs their own writers for this, and I’m proud to be one of them in my own way, and part of the #LoveOzYA movement. And thank you to Mary Grant Bruce, who died long ago, in 1958, but her feisty little heroine Norah will live forever in my heart and brain. 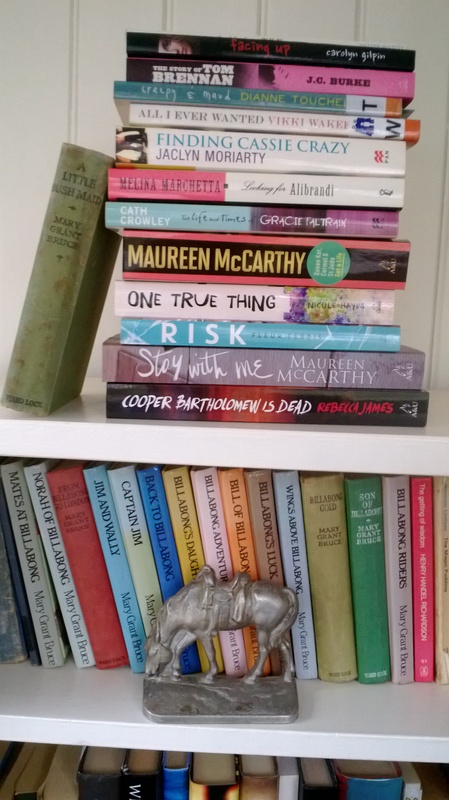 This entry was posted in Young Adult book and tagged #LoveOzYA, Australian Young Adult books, Billabong series, early reading influences, Mary Grant Bruce, Norah Linton, YA, Young Adult. Bookmark the permalink. I read those books so many times! She captured the beauty of the bush and brumbies so well 🙂 Great to find another Billabong fan, thanks Leonie! I think this American would have loved this series – even without any knowledge of Australia as a kid (other than that place where I had all those cousins and where Crocodile Dundee lived). I actually kind of want to read them now, as an adult! They stand up to a read today, despite some squirm-making descriptions of other cultures – the author had a very dry sense of humour 🙂 I’m trying to think of a US equivalent – Little House on the Prairie was amazing but I don’t think Laura was quite as active! It doesn’t sound like it – but I did love those books. I also loved Island of the Blue Dolphins, by Scott O’Dell. The heroine basically gets left alone on an island. I thought this was so cool, which is probably not the way I was supposed to think about it. I just wanted the whole chocolate factory!